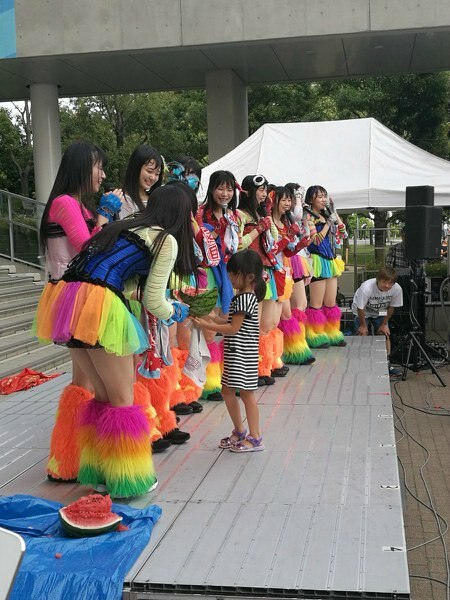 A cute little side story; At one point they brought a young girl up on stage to try and break open a watermelon. Originally they had her blindfolded, trying to break the it with a wooden stick. That didn’t go very well, so they eventually took the blindfold off, and then helped her with the stick until finally she cracked a hole in it. When I went to take the cheki, I had decided I would choose Anna since she was the one girl I knew. I did consider picking Kojima just to mess with her. 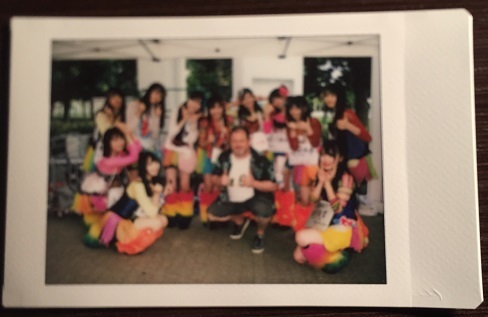 But the manager asked if I wanted to do a full-group cheki. Well, okay. Yeah, it’s kinda blurry. The actual cheki looks fine. I actually had the opportunity to be right in front, but I didn’t want to stand there waiting for so long. 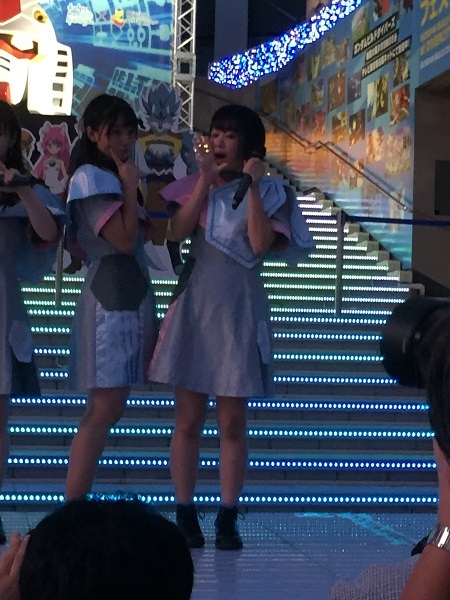 Plus it was on the far left, which is the opposite side from where Tanifuji Misaki usually stands on the stage. I instead took a spot on the far right next to the camera bay. The members came in from the parking lot and went into the tent. 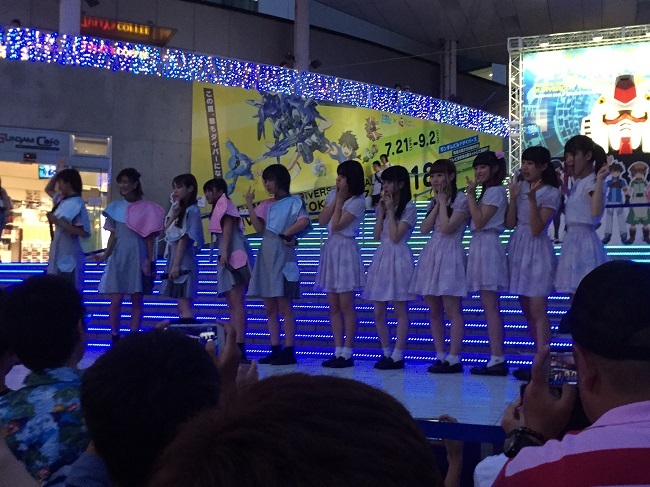 Ahh, so in addition to KissBee, KissBee Youth, their kenkyuusei unit was also in attendance. The members came out for a sound check, but there was a major issue with all of their microphones, so they went backstage. In the meantime theKenkyuusei came out and performed one song. There is really nobody in KissBee Youth that I know or even care about, so I was glad their set was short. In the meantime the main unit returned, quickly checked their mics, and went directly into a song. It took a while, but Misaki-chan did eventually notice me standing there and waved. 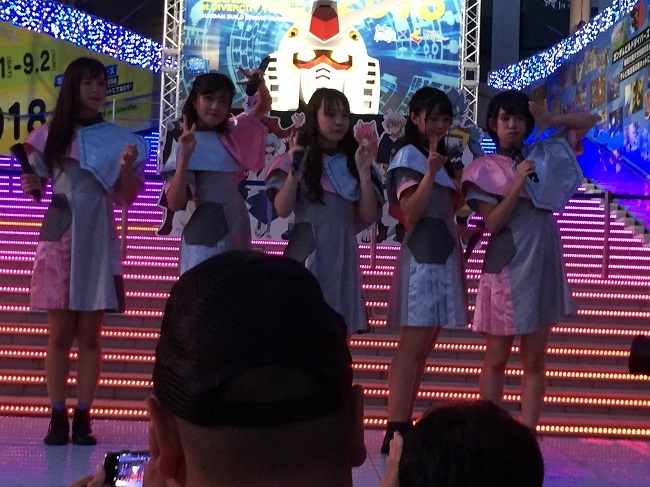 Technically, KissBee is a more mellow group, but their setlist consisted mainly of their lowest energy songs. For a weekend festival crowd like this, I’m not sure I would’ve chosen those songs. It had such a different vibe from Kamen Joshi, and also didn’t draw in nearly as many passers-by. The final song they did was more medium-tempo, so I guess they raised their energy for that. Ultimately they sang around four songs in total. Misaki-chan with a new member I am not familiar with. Like Kamen Joshi, KissBee also does a free “High Touch” after the show, and of course I got an excellent reaction from Misaki. I had two tickets, and had decided instead of doing a cheki (2 tickets) I would instead do a shamekai and a handshake, which were one ticket each. I lined up early for the photo, and was the third person to see Misaki-chan. I got a big ‘hisashiburi‘ before apologizing, and admitting I am a “bad fan.” She was like “No you’re not! You were busy, ne?” I told her I would explain more when I came back for my handshake. 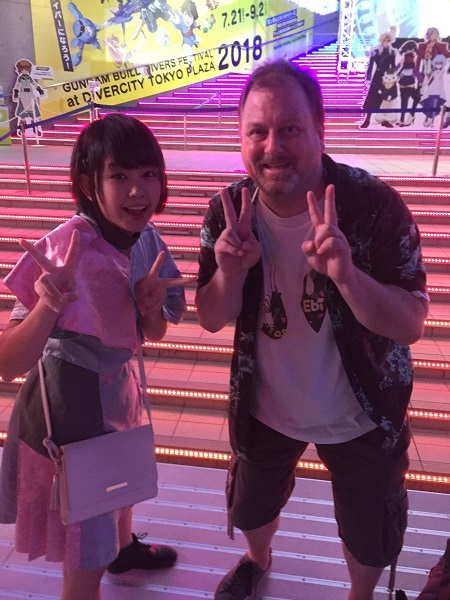 When I met with her for the handshake, I told her that I was really busy with school, and that Kanji class was very difficult last semester, so I wasn’t going to many idol events. Technically, that is a half-truth. 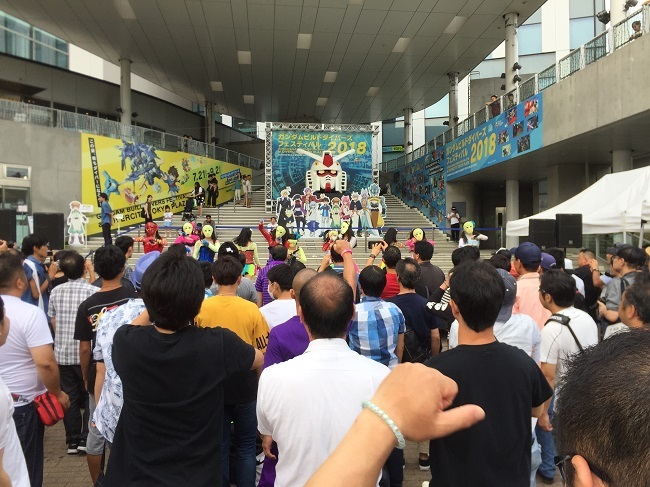 I do go to idol events, but I cut down on the indie groups since they are generally more expensive to see, and frankly KissBee hadn’t been doing any in-store events that were convenient for me to attend. In any case, I told her I was happy to see her, and thought the blue streaks in her hair were cool. And with that I said goodbye. 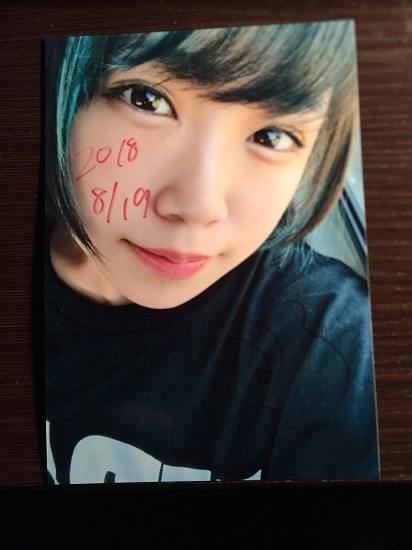 LOL, she forgot to sign the pic, she only dated it. I went back into the mall to have dinner. When I finished dinner and went back downstairs the event was just ending, so it went on for a while. I headed for the station to go back home. It had been a full 27 hours of idols for me, seeing HKT48, Minyo Girls, Kamen Joshi, KissBee, and I was not done yet. I had won a ticket to see SKE48 in Nagoya Monday afternoon. I had contemplated taking the overnight bus to Nagoya to save a bit of money, but at that point I was exhausted. I just didn’t feel like going home, changing clothes, and turning right back around to catch a bus. Not to mention all my electronics needed to be charged, including my portable charger. Anyway, I would feel much fresher for Nagoya after a good night’s sleep!